Get your whole house and freedom of movement back, no matter the shape of your stairs. Whether your staircases have landings, take a turn, have one curve or many or go up one floor or three, we can fit a curved stairlift that will give you back your independence. When you buy your stairlift for curved stairs you’re thinking about your wellbeing for years to come. You’re planning for a healthy, active future with added peace of mind for you and your loved ones. Our stairlifts are built to last decades. That’s decades of knowing you’re safe in your own home. Are my stairs right for a curved stairlift? If your stairs take a turn, we can safely say that yes, they are. We can make a stairlift to fit your home. Stannah curved rails are made to measure. They’re manufactured to be the perfect fit for you and your house. The engineers that make your stairlift can see your name on the order. Every time they stamp your unique customer number onto a part of your stairlift they think of the difference the lift will make to your life. You aren’t just another number in a production line, the lift they’re making is specifically for you and your house. You, your stairs and your needs are what makes every rail personal to us. And our team is proud of every rail they make. All the little details we add mean you can use your stairlift without even thinking about it. Wherever you are in Ireland, when the measurements of your stairs are taken, they are sent straight to our factory where work begins on your rail. All our stairlifts are manufactured in the EU, complying with the strictest of health and safety regulations. See all our stairlift models for curved stairs. 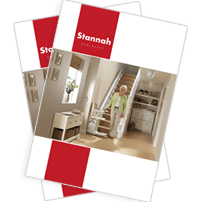 We’ve been stairlift manufacturers for over 40 years. We’ve had time to hone and develop our stairlifts to make them as safe and comfortable as they can be. It’s the little things that make all the difference. Each curved stairlift we make has an easy-to-use seatbelt and safety sensors. You can strap yourself in and know your lift comes to a gentle stop if there’s anything in its way. All of our curved rails are assembled and tested prior to installation. So, we know that they will fit seamlessly, making the installation process quick and easy. The electric motor of your stairlift carries it smoothly up and down the stairs. It stops, starts and accelerates smoothly, and it never jolts, so you’re safe from back injuries. All our chairs are cushioned. The seat and the back of the chair are soft so that you can enjoy every ride. We’ve thought about the little things that make a big difference. The rail is what makes your stairlift fit your stairs, but it’s the chair that meets your needs. From different chairs to fabrics and colours, you can make your stairlift your own. The measurements of your stairs are taken so that the rail we build fits to every bend as snugly as possible. That means more room for everyone else to use the stairs easily.